Lauren from Wearing History sent me this fabulous leaflet she found in a 1907 McCall's magazine to share with all of you. It gives details on what all the notches and holes stand for in the early unprinted McCall patterns. What a find! Thanks Lauren!! I love the illustrations, this leaflet is beautiful! I LOVE how they claim to be the "Simplest Most Easily Put Together and Best Fitting Patterns in the World". I just wonder when two darts in the front of a garment stopped being the norm. Looking at this pattern I can see how easy it would be to alter it for different cup sizes. 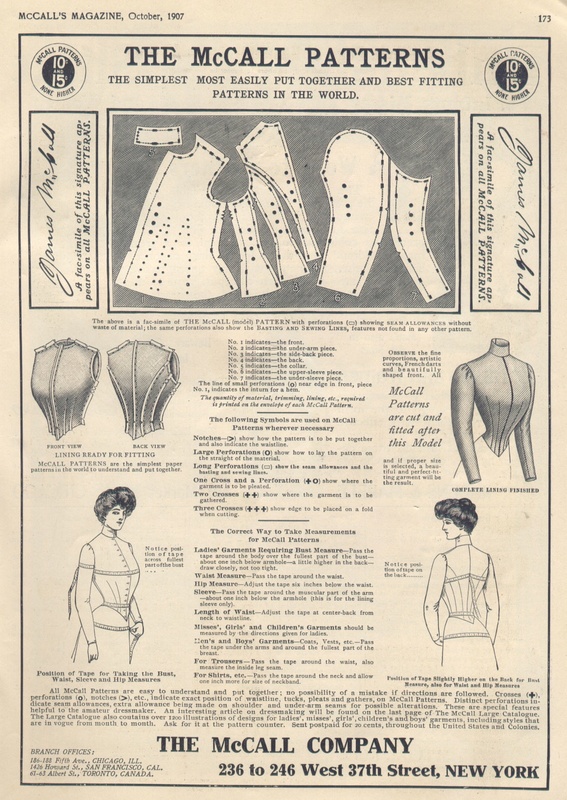 Because of corsets they apparently expected waist to bust sizes to be hugely different so accounted for them in the patterns. I love this! It's a treasure and so nice of you to share!